Sports Rendezvous: Gold Coast 2018: Team Nigeria parade in national colours during opening ceremony of Commonwealth Games. Gold Coast 2018: Team Nigeria parade in national colours during opening ceremony of Commonwealth Games. Blessing Okagare leads Team Nigeria as the flag bearer during the opening ceremony. Team Nigeria were alluring in the national colours, green and white during the opening ceremony of the 2018 Gold Coast Commonwealth Games at the Carrara Stadium on the Gold Coast. 90 athletes will represent Nigeria in Australia and will compete in nine events including athletics, basketball, wrestling, weightlifting, boxing, table tennis, special sports and gymnastics. 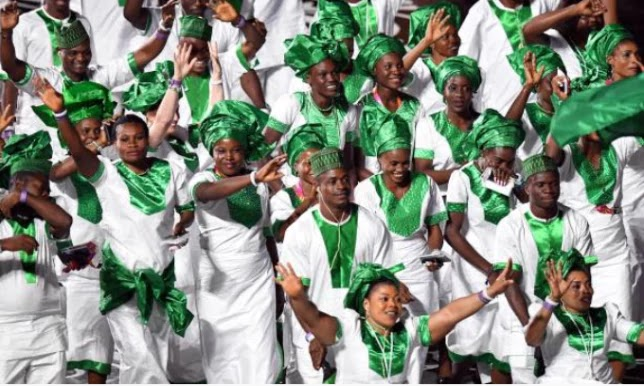 Led by Nigerian sprint queen Blessing Okagbare, the Nigerian representatives paraded themselves during the opening ceremony in traditional colours. There were all dressed in white-and-green native attires. They also completed their outfits with green scarfs for women and green cap for the men.